The need for certain innovations is just too obvious to explain why they’ve taken so long to emerge. One example is the process of assessing an investor’s risk tolerance for generating retirement income. Why is this important? Certain types of retirement income are guaranteed (lifetime annuitization and GMWB income, as examples). Other income streams are not guaranteed and are, in fact, contingent upon the attainment or targeted, future investment returns over decades. What percentage of guaranteed versus non-guaranteed retirement income is appropriate for any given investor? And what targeted rates-of-return should be selected for that component of retirement income that is variable? It’s now possible to answer these questions due to the advent of a formal retirement income risk assessment process. The risk assessment process begins with the completion of an online questionnaire that results in a “Guarantee Factor Score” and a “Volatility Factor Score” for each investor. Taken together the two scores provide financial advisors with the information necessary to illustrate a retirement income plan with just the right combination of guaranteed versus variable retirement income streams, not to mention the appropriate rates-of-return model for generating the variable income component. This is big news, in my judgment. Suitability is well-served by the process of assessing retirement income risk tolerance. For example, is there a better way to provide a compliant context and process around the selection of a variable annuity GMWB rider to serve as the guaranteed income component of a retirement income plan? Rather than positioning the variable annuity as the “solution” to deliver retirement income, an inherently better approach is to position it as a vital component of a larger income distribution strategy. I believe that positioning VAs in this manner will not only enhance suitability but will also lead to expanded sales of variable annuities. The theme of assessing retirement income risk will be explored further in the coming weeks. Next month a large, independent broker-dealer will introduce the first online retirement risk assessment application. It’s an exciting development that I believe will lead to improved compliance and suitability through a whole new outlook on planning for retirement income needs. I am pleased to announce that Keith Strykula, Founder and Chairman of the non-profit Structured Products Association (SPA) has agreed to an in-depth interview as part of the Industry Leaders & Innovators series. I’ll explore a variety of issues with Strykula including his vision for the scope of structured products in the consumer market and specifically their future utilization in Boomer retirement security. Sales of structured products, which historically have occurred primarily in the institutional markets, are expected to reach $100 Billion in 2007. With more than 2,000 members, the New York based SPA is an organization whose mission includes positioning structured products as a distinct asset class; promoting financial innovation among member firms; developing model “best practices” for members and their firms; identifying legal, tax, compliance and regulatory challenges to the business. With more than 2000 members, the Association has members from the exchanges, self-regulatory bodies, legal compliance community financial media, investor networks, family offices, and both buy-side and sell-side structured product firms. Strykula founded SPA in 2003. His career started in 1991 when he joined CSFB’s Legal Department from Fordham University School of Law to oversee legal, regulatory and compliance issues related to First Boston’s derivatives effort. While practicing as a derivatives attorney, he was a member of the FIA Law & Compliance Executive Committee, the SIA Options and Derivatives committee and served on the Business Conduct Committee of the Philadelphia Stock Exchange. 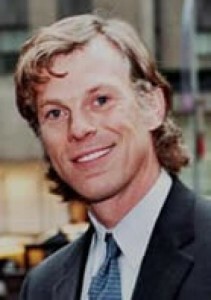 He moved to the business side of equity derivatives in February 1997, reporting to the head of equity derivatives at SBC Warburg (renamed UBS following the merger). At UBS, he created the first structured product linked to the Dow Jones Industrial Average (issued by IBM). He returned to CSFB in July 2000 to launch the structured products platform for the newly acquired DLJ Private Client Services group, which placed $1.2 billion in its first year. He is frequently quoted in the financial media as an authority on derivatives, structured products and the next generation of investments for U.S. and was profiled in the February 2004 issue of Risk magazine on his vision for the future of structured investments. The March 2006 issue of Structured Products Magazine interviewed him on his groundbreaking new structured products platform he launched in the U.S.
Meir Statman’s research focuses on behavioral finance. He attempts to understand how investors and managers make financial decisions and how these decisions are reflected in financial markets. The questions he addresses include: What are the cognitive errors and emotions that influence investors? What are investor aspirations? How can financial advisers and plan sponsors help investors? What is the nature of risk and regret? How do investors form portfolios? How important are tactical asset allocation and strategic asset allocation? What determines stock returns? What are the effects of sentiment? Professor Statman’s research has been published in the Financial Analysts Journal, The Journal of Portfolio Management, The Journal of Finance, and many other leading journals. He is a member of the Editorial Board of the Financial Analysts Journal, the Advisory Board of The Journal of Portfolio Management and the Journal of Investment Consulting, and is an associate editor of several other professional journals. The recipient of a Batterymarch Fellowship and two Graham and Dodd Awards of Excellence, Professor Statman has consulted with many investment companies and presented his work to academics and professionals in many forums in the U.S. and abroad. Macchia – Meir, to begin, would you describe your position at Santa Clara University, and, in general terms, the focus of your work? 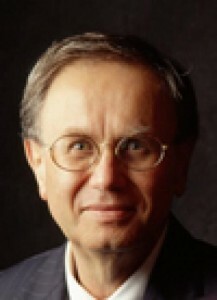 Statman – I hold the Glenn Klimek Chair as the Professor of Finance at the business school of Santa Clara University. My work, broadly, is in behavioral finance, and behavioral finance is quite broad itself. Behavioral finance describes the financial behavior of investors, managers and consumers, such as saving, trading, and portfolio formation. It describes the interactions among investors, managers and consumers in financial and capital markets. And it describes how such interactions determine stock prices and trading volume. It also prescribes more effective financial behavior to investors, managers and consumers. Macchia – Meir, what sparked your interest in behavioral finance? I mean, going back to your earliest decision to research in this area. Statman – There was no behavioral finance when I started working on behavioral finance. I was attracted to it by what we know formally as ‘critical thinking,’ that is, putting theory and evidence side by side and seeing whether they fit. An experience that sparked my early research relates to the distinction people make between income, such as dividends, and capital. As students of finance know, Merton Miller and Franco Modigliani proved in 1961 that it is not rational to distinguish dividends from capital. I studied that in the late 1960s at the Hebrew University of Jerusalem. The theory makes sense. If an investor does not receive a dividend check she was expecting she can sell a few shares to generate ‘homemade dividends’ in an amount equal to what she would have received in a dividend check. I came to New York in late August 1973 to study for my Ph.D. at Columbia University, just before the Yom Kippur War of October 1973 and the Arab embargo that followed. Oil prices zoomed, lines formed at gas stations and Con Edison, the utility company of New York, eliminated its dividend. The Con Ed shareholder meeting in 1974 was a riot. Elderly people screamed about the loss of dividends and some were ready to string Con Ed’s Chairman on a wire. The facts of the shareholder reaction did not conform to theory. Why were Con Ed shareholders so upset? Why didn’t they simply create homemade dividends by selling a few Con Ed shares? The discrepancy between theory and evidence stayed with me and later on, in 1980, along with my colleague Hersh Shefrin, I could see the connection between my observations and the work of psychologists Daniel Kahneman and Amos Tversky about cognitive biases and prospect theory, self control and regret. I could find in that and similar work tools that not only enable me to see gaps between theory and evidence, but also bring the two closer together. Macchia – Interesting. Meir, would you say that, then, in terms of what we describe as the field of behavioral finance, that you are the seminal individual in developing that field? Statman –I was among the early ones but I surely was not the only one. The early group of economists and financial economist included Richard Thaler, Robert Shiller, Hersh Shefrin, myself and very few others . Macchia – Thank you for clarifying that. I looked at some information about you on the web and , of course, I’ve heard you present. Wealth2k had the honor of sponsoring one of your wonderful recent addresses. Statman – And I thank you for that. Macchia – You’re welcome. This occurred at RIIA’s 2007 Managing Retirement Income Conference, and it was just a wonderful address that you gave. I know that some of the research questions that you focus on are actually specified on your website and I’d like to ask you about a couple of them. One of the issues that you deal with is the cognitive issues and emotions that influence investor behavior. Could you talk a bit about what you’ve uncovered in your research? Statman – The cognitive biases have been uncovered by psychologists such as Daniel Kahneman, Amos Tversy, Paul Slovic and Baruch Fischhoff. What I have done is to ask whether these provide insights into the behavior of investors and managers. Let me illustrate with hindsight bias, a favorite of mine. We all experience hindsight in our daily lives. It is the sense that what we know in hindsight we could have also known in foresight. The controversial example I’ll provide is not from finance, but from 9/11. Today, in hindsight, it is absolutely clear that all of the signs of the attack were obvious before 9/11 to anyone who bothered to look. But hindsight is not foresight. What we know at the end of a mystery novel we did not know a few pages before that end. Once the stock market’s 2000 crash came it was absolutely clear that it was going to come. But if you actually look at the record you find that the famous Greenspan “rational exuberance” speech was in 1996, not in 2000. Look at pre-2000 issues of the Wall Street Journal and you’ll see that at any time there were people who said that the market would go up, and people who said that it would go down. What was clear in 2000 was not clear in 1996. Hindsight causes us a lot of grief because it makes us feel stupid. “Why didn’t I get out of the stock market in 2000?” And yet hindsight gives people the confidence that can tell the future as easily as they can tell the past. So people try to time the market and usually end with more chagrin than joy. They finally decide to get out of the market in early 2003 when the market was at low and come back in 2007 when it is higher. Macchia – You bring up something that I’ve found very interesting for many years, and I’ve often quoted the statistics that are published annually in DALBAR’s Quantitative Analysis of Investor Behavior, where the focus is on mutual funds, and the actual mutual fund returns that individuals realize compared to the S&P 500. What typically seems to happen is that over 20 year periods of time, the individuals underperform the index by perhaps 800 or 900 basis points. Statman – The DALBAR numbers are exaggerated, but better studies show that investors underperform by 150-200 basis points per year because of poor market timing decisions. That is quite a lot. That is more than most financial advisors charge for their services. Advisors earn their fees easily if they only prevent clients from doing foolish things, like timing the market. Macchia – Let me ask you about another topic that I know you’ve studied a great deal and that is insurance and annuities, and some of the reasons that they are arguable underutilized by individuals. What would your views be in terms of explaining why this occurs? Statman – It is a fairly complicated problem, as you must know. Why don’t people annuitize their capital, when this seems the rational thing to do? After all, annuities provide income for life, eliminating the risk that we might run out of capital. I think that people stay away from annuities for psychological reasons. For example, people have difficulty with problems that involve money over time. An immediate annuity that pays $80,000 per year might cost $1 million. That annuity might be fairly priced, but it is hard for a man who sees himself as a millionaire to come to terms with the fact that today’s upper class million is worth no more than a mediocre middle class income of $80,000 per year. Another psychological barrier is the distinction people make between capital and income. I mentioned it earlier in connection with dividends. People follow a rule of “consume from income but don’t dip into capital.” An immediate annuity is a clear form of dipping into capital and people are reluctant to engage in it. Macchia – Let’s talk about another risk- the loss of one’s life. In the event of untimely death, life insurance is uniquely able to provide a large sum of money to beneficiaries in return for a relatively nominal amount in terms of the premium for the policy. It’s a big multiplier effect that over many years has provided the safe harbor for many families. It’s saved many families from financial ruin, yet most would agree that life insurance is underutilized and underappreciated. I have my own theories about why that might be and I’m wondering if you have some ideas? Statman – I think that life insurance makes a lot of sense for many people such as those who are supporting children. Loss of life of parents is always a disaster for children but the disaster is compounded if money disappears as well. So why don’t all people who should buy life insurance buy it? There are really many reasons from, “I don’t think it’s going to happen to me” to “I don’t have the money for that.” People are motivated to buy insurance against hazards that are scary. Dying is scary but not as scary as dying of cancer or dying in an airplane crash. So some people are willing to buy insurance against dying of cancer or dying in an airplane crash while they are less ready to buy plain life insurance that covers these two causes of death and all other ones. Macchia – Meir, I’m wondering if you think that there’s a role for life insurance for people who earn higher than average incomes, for whom, for instance 401(k) deferrals may be insufficient in order to set up enough retirement income. Life insurance in terms of say a variable universal life policy offers growth potential and the access to cash through policy loans is income tax free. Do you think that combination of benefits may make sense for some people who are looking for other, supplemental ways to create retirement security? Statman – I wonder if combining elements of savings and insurance makes sense. Term life insurance covers the risk that an income earner might leave a family with no income at the early stages of life when wealth is low. Saving can be done separately. Separation of insurance from savings reduces complexity and there have been many stories about how complexity has been used to hide pretty high fees. Macchia – Meir, I’d like to shift gears and ask you a couple of personal questions. These questions are a consistent theme in these interviews and I find them to be ones that generate some fascinating answers. The first question is this: If I could somehow convey to you a magic wand and by waving this magic want you could affect any two changes relative tin they world of financial services that you wish to make, any two things at all, what would they be? Statman – Good financial advisors are like good physicians. They know the science of finance as physicians know the science of medicine, but they also have a human touch. They listen, empathize, diagnose, educate and treat. Most physicians do just that, and so do most financial advisors. But not all do that. If I could have a magic wand I would use it to direct all the energies of advisors to their clients and all the energies of physicians to their patients. Macchia – Next question: If you were not the Glenn Klimek professor of finance at Santa Clara University, but instead could hold any position in any other field, what would that be? Statman – I really am one of those fortunate people who are in the right position. My work is varied and deeply satisfying. I get to write, do research, teach, interact with fellow scholars and practitioners like you, learning a lot from those interactions. Happiness comes with autonomy, contributions to others and the ability to develop one’s skills. I surely have all three. I pretty much control my time, have wonderful interactions with students, colleagues and practitioners, and I always push myself to examine new problems and engage in new projects. Macchia – Not a bad life. Statman – Not a bad life at all. I could have enjoyed a similar life as a scientist in many fields but surely not as a politician. Politicians must bend the truth to satisfy constituents. I would find it difficult to do. Macchia – Well, you clearly made the right choice. I noticed that you didn’t say psychologist. Statman – No, I don’t think that I would want to be a practicing psychologist. I don’t think that I would want to be a practicing financial advisor either. Advisors get a lot of gratitude from investors, and my sense is that the best clients are like my best students. I would enjoy educating them. But I don’t know if I would have been able to keep my cool in meetings with clients who complain that while they have done okay, Joe, their neighbor, has done better. I would probably say something that would make them clients of somebody else. Macchia – I love your answer and here’s the last personal question: You’re 60 years old. I’d like you to imagine your own retirement in its most conceivably perfect form, where will you be and what will you be doing? Statman – I have a boring answer, I’m afraid. I’ll be right here where I am and doing exactly what I have been doing for as long as my body and mind allow me. More generally, I see two groups of people. People like me who answer quite truthfully that they would retire only when they die and people who choose to retire at 62 when they can qualify for social security. I understand that different people have different circumstances and preferences but I feel sad for the second group. Macchia – Your answer is remarkably similar to the one that I got from Moshe Milevsky. What came through to me in his answer was the passion that he has for teaching. He said that he wants to be teaching until his last moment. You didn’t say exactly that, but is it similar to you in terms of the teaching? Statman – No…I wouldn’t say that. I think that teaching is satisfying, and I enjoy it. There is a wonderful sense when you leave the classroom and you see in the eyes of the students that they have learned what you were trying to teach and found it useful and stimulating. But teaching can become routine. I like to find and propagate new ideas. When I was little my mom would say, “Whatever people say, Meir, you must say the opposite.” She would say it with equal parts of pride and exasperation. I was a generally agreeable child and I’m a pretty agreeable adult today, but I continue to say, “Wait a minute. They say that this is true, but perhaps they are wrong.” There is special joy in overturning accepted truths. That joy animates me that I hope I will never lose it. Macchia – I hope so too. And thank you. You just made me feel better about my 7 year old son’s future. Statman – Exactly. Don’t raise conformists. By the way, I don’t know if you agree or if it has room in the interview. I think that parents today are fearful about the future and raise their kids in a regimented way that reflects that fear. I am optimistic about the future. I think that parents, I am one, need to lighten up, listen to kids and guide them with a lighter hand. Macchia – That is really good advice. I’ve recently read Walter Isaacson’s wonderful book on Einstein. Einstein is someone who I’ve read about and is a personal hero of mine for many reasons. Einstein’s inclination to always challenge conventional wisdom, challenge authority and be an independent thinker is the notion that you’ve been describing. It certainly did well by him. Statman – I admire Einstein even though physics is beyond me. I like science but I’m especially interested in science about people, such as biology and neurology, not in science about the physical world, such as geology or physics. Macchia – I don’t know if you perhaps have 5 more minutes that you can give me for the exploration of another topic. This is in regards to the research that you’ve done, which I gather is a favorite subject and I’m interested to know, that is researching the investment performance of companies that are admired versus despised. You’ve recently co-authored a paper on this and I’m sure it’s not the first paper. How did you get on this topic and what did you find out of the research that you did in this area? Statman – I started with this project many, many years ago. In fact, the first Fortune survey of admired companies appeared in 1983 and I read it and said, “Wow. Let me check if the most admired companies provide the highest stock returns.” My guess was that they provide the lowest returns because investors become enamored by admired companies and push their stock prices too high. That is what I found later in my research. But what is generally true is not true with every stock every day. In 1983 I put $5000 into 3 stocks that were least admired in the Fortune survey. I held them for a few months, maybe a year. Their performance was absolutely terrible. Eventually I managed to find the courage to realize my losses and move on. It surely taught me a lot about diversification and about the difference between short time horizons and long ones. Macchia – Meir, I can’t thank you enough, for taking so much time, being so forthright in your answers and providing so much insight. This has been a real treat for me. Statman – You are very, very kind. I really enjoyed speaking with you and hope that we will continue to keep in touch. Don’t you just love YouTube? It allows everyone in the world to see what everyone else in the world is doing. No wonder that by July of last year YouTube was streaming one-hundred-million videos each day. This July it may be up to 200 million for all I know. You might wish that video had not won the peoples’ choice award for preferred information conveyance vehicle but it’s too late. The votes are in and it was video in a landslide. 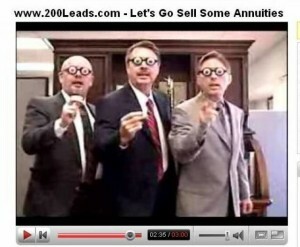 Now everything is watchable, even annuity agent recruiting ads. (Or even a video to promote this blog. Click here to see it). Historically, if you wanted to see some examples of advertising that many might describe as sleazy you could look to agent recruiting advertisements created by certain annuity wholesaling firms (variously described as FMOs, IMO, Marketing Companies) that are designed to entice annuity agents to sell indexed annuity products. This type of advertising is generally confined to insurance industry magazines and email campaigns to agents and is paid for by marketing companies that typically cater to indexed annuities. I’ve seen this form of advertising for many years and I know that it has often been effective in attracting a segment of annuity agents who fall prey in a serial manner to “get rich quick” invitations. But that was before the dawning of the digital age in annuity land. Today I offer you a peek into this arcane world because I can no longer avoid doing so. My hand has been forced. The reason, once again, is that even this peculiar advertising genre has migrated to the Internet. Let shine the white-hot light of public scrutiny!! Today’s example takes my oft repeated comment that the annuity business shoots itself in the foot every three minutes and accelerates the pace to every thirty milliseconds! I introduce you to Mr. Gary LeMon who casts his gaze into your web browser and asks, “Are you rich yet? No, seriously! Are you rich yet?” (Click the video image below to see it). Fixed indexed annuities obviously changed Mr. LeMon’s life, and now he wants to change the lives of other annuity agents by helping them “make a fortune selling indexed annuities.” In fact, he’s developed quite an elaborate system to do so. The annuity industry needs to think through the implications of messages like Mr. LeMon’s being available for anyone to see including, of course, the press, regulators and consumers who may already own or may be asked to purchase annuities in the future (recall the famous New Yorker cartoon: a dog is typing on a keyboard and staring intently into a computer monitor; the caption reads: “On the Internet no one knows you’re a dog”). Well, on the internet we can’t know who’s watching Mr. LeMon’s get rich pitch. Here’s a question: After watching Mr. LeMon’s video would a nice lady from Topeka who’s interested in learning how to invest her $500,000 in 401(k) assets because she’s preparing to retire be interested in putting her money in an annuity? What’s Fidelity’s number, again? On the one-to-ten scale that measures how much I worry about the annuity industry’s future, the migration of agent and marketing company advertising to the Internet takes my concern into uncharted territory. Who needs the New York Times or Parade Magazine to damage the public perception of annuities and the agents who sell them when the agents and marketing companies can do it more quickly and less expensively themselves? Glory! We’ve discovered technology! I wish I could get insurance company executives to move a little more quickly to the video party. For a few years now I’ve been trying hard through the creation of web-based communications networks to build the compliant infrastructure that annuity providers need to get out in front of the video revolution. With some notable exceptions (all Wealth2k clients, I’m proud to say) the providers have moved slowly. The video party did begin, however, but the agents brought the keg. Mr. LeMon, may I suggest that you do your industry and your agents a favor: show your video at a recruiting meeting that’s not so global. PLEASE NOTE: Coming Tuesday morning: a fascinating interview with behavioral finance authority Professor Meir Statman of Santa Clara University. Yesterday’s essay focusing on the indexed annuity marketing utilized by Tony Bass of Georgia elicited quite a lot of interest. I heard from Mr. Bass who informed me that he removed his YouTube video and “free report” as a result of my writing about them. He also asserted that he was not attempting to mislead anyone with his marketing strategy. While there’s no condoning the inaccurate content of the materials used by Mr. Bass, they signal a larger issue which annuity providers can’t duck: How are annuity agents to remain financially viable in the face of the most hostile annuity marketing real environment in memory? That’s a critical question that screams for a viable answer. Providers’ continuing reliance upon independent agents hangs in the balance. Mr. Bass told me that his marketing strategy was “not to give away everything up-front” and to have “prospects call him.” This is entirely understandable when you consider that had he employed a marketing strategy that placed his agenda to sell annuities front-and-center it would have resulted in almost certain failure. This is why agents seek to obtain meaningless professional designations, portray themselves as “senior advisors” and “safe money experts”, and generally hide their true annuity sales agendas. It’s also why some state securities regulators have begun to prohibit such practices. How far the indexed annuity business has sunk. It has literally lost the ability to properly convey the value of its products. This points to a leadership vacuum… and a business opportunity. When a market devolves to this extent the opportunity for creative entities to succeed is increased exponentially. In an academic sense that’s the good news. The key question is will any provider show the courage that will result in their scooping-up the indexed market? This is the rarest of opportunities to quickly create an unlevel playing field. I frankly owe a sincere apology to Allianz Life. I guessed wrong on the product Mr. Bass was aiming to sell. It wasn’t Allianz’s MasterDex 10 annuity. I’m sorry for this inaccuracy. What was it then that Mr. Bass wanted to sell? It was an indexed annuity that is issued by Des Moines, Iowa based American Equity Life. American Equity also offers an indexed annuity that provides a bonus of 10%. This annuity was, I’m told, designed to compete favorably with Allianz’s product. We at American Equity are committed to maintaining high standards in sales practices. We have a stringent set of advertising guidelines that our agents are required to adhere to when marketing our products. Had Mr. Bass submitted the contents of his video to us for evaluation under our advertising guidelines it would not have passed muster, and we will communicate that to him. We also require our agents to use clear and concise disclosures of all product terms at the point of sale, and we conduct our own in-house suitability review of every sale prior to contract issuance. Mr. Bass has been appointed with us for several years but has had only one sale in all that time. That would tell us our process is effective. What Have We Learned? And Haven’t? In the past 24 hours we’ve learned that Mr. Bass’ agenda was to indeed sell indexed annuities. We now know the company and product he wished to sell. We know that Mr. Bass has withdrawn his misleading marketing materials. And we know that American Equity disavows marketing tactics like those used by Mr. Bass. We’ve also learned something about the importance of video that has potentially far-reaching implications and future liability potential for annuity providers. As agents move their sales practices to the Internet there’s no hiding what they are doing. Just as surely as the YouTube culture is impacting politics it will also impact insurance and financial services. This is why product providers must move aggressively to supply agents compliant video educational presentations lest they develop their own for consumers who prefer to learn by watching rather than reading (look for more on video-based agent marketing that will appear here in the near future). What we’ve not learned is how annuity agents will compliantly navigate through today’s aggressively hostile marketing environment. I’m convinced that most annuity providers in spite of their best efforts have no practical ability to control the marketing activities of agents who grow more and more frustrated with each article that appears that is critical of annuities. As exemplified by the recent front page expose in the New York Times, it may be that we’ve still only scratched the surface of what’s to come. “The Process” continues to play-out to the detriment of the annuity business. The value proposition inherent in an indexed annuity is exceedingly valuable to many people, especially those in the transition management phase of retirement. While undue product complexity can impede the clear conveyance of that value to consumers, I have a good deal of sympathy for Mr. Bass and other agents like him who believe sincerely and strongly in the legitimate economic value annuity products provide to Boomers and seniors. It’s a calamity on the scale of a Greek tragedy that they can’t tell anyone in a straightforward manner. I don’t know where to begin or who to blame: The annuity agent trying hard (and very creatively) to market indexed annuities? Or the carrier or carriers he represents? The regulators? Maybe it’s just a manifestation of “The Process” out of which negative results emerge from the efforts of good people. Today I introduce you to Mr. Tony Bass, although I have never met him in person. I have met him online. My guess is that he is a very decent man who has undertaken a misguided indexed annuity marketing campaign. I’m sorry to be critical of his methods but I can’t ignore them given that they are on display for the entire English-speaking world to hear and see. Mr. Bass’ medium is the right one. He’s using video to convey his story professionally and effectively. I applaud him for delivering it in this manner. It’s his story”s content that I believe is simply fraught with problems. Regular readers will be familiar with the long and detailed exploration of annuity sales practices that has accounted for so much attention at this site. Today I offer you a particularly egregious example of how the public can be misled about indexed annuities. This one is for the text books. I sincerely admire creativity. Mr. Bass seems to have plenty that could and should be channeled into compliant marketing strategies. Mr. Bass’ example of indexed annuity marketing demonstrates the limitless creativity of producers. It also demonstrates how misleading sales practices are making the leap to digital delivery, a development that brings with it new levels of liability potential for indexed product providers. Any pretense that a misleading marketing campaign might be confined to an agent’s local territory is blown away once it has been migrated to the internet. Moreover it’s going to be potentially more difficult for a provider to deny knowledge of its agents’ poor sales practices when those practices are exposed for all to see on demand. Bass’ video never explains what the “strategy” is or how it is able to pay 13.68%. It’s implied that the answer will be discovered by visiting his website. More on that, later. Bass’ target market is 401(k) pan participants who have left their employer and have a critical decision to make in regards to their accumulated 401(k) account values. In his video Bass tells viewers that it is a mistake for employees to leave accumulated assets in their previous employer’s plan, and also that it is a mistake to roll those assets into a new employer’s plan. • NO fees or commissions to pay EVER! • NO stock market risk to your principle EVER! • NO losses – ALL gains are automatically “locked-in” each year! • NO taxes to pay – Tax deferred until you need the money! Next Bass’ report implies that mutual finds have expenses that are high, that the average portfolio manager has insufficient on-the-job experience, and that the average mutual fund turns over “90% of their portfolio annually.” Bass’ report even hammers no-load mutual funds. Part of a Dangerous New Trend? I searched Bass’ company on Google and found a link to the site www.tonybass.net. There I learned that Bass Financial Solutions is a registered investment advisory firm in the state of Georgia. This has caused me to think more about the recent trend among annuity agents who seek to form registered investment advisory businesses in various states as opposed to Federal RIAs. I think that when annuity agents become registered investment advisors they undertake a potentially dangerous course if they persist in acting as annuity agents in the traditional manner. Moreover, if the motivation to become an RIA owes to the desire on the part of the agent to side-step broker-dealer oversight it’s almost surely to ultimately play-out badly for the agent. Why? RIAs are fiduciaries by definition. Annuity agents, on the other hand, are bound to uphold the best interests of the insurance companies they are licensed to represent. Can an individual simultaneously serve two different agendas? Can RIAs simultaneously put their clients interests ahead of their own while still carrying on their traditional annuity sales and marketing activities? To me these are oil and water paradigms and the two competing agendas cannot coexist within the same client relationship. Generally speaking I think the idea of annuity agents becoming RIAs is a formula for disaster for all parties. After reading Bass’ report I believe that his agenda is primarily to sell Allianz Life’s MasterDex 10® annuity. Unfortunately, this is never revealed in Bass’ marketing materials. MasterDex 10 is a complex fixed indexed annuity that offers a 10% “bonus” on premiums paid during the first five contract years. When added to a base interest rate of 3.5% plus one year’s worth of compounding, the stated total first year rate becomes 13.86%. If not explained properly the 10% “bonus” can be highly misleading. In the context of Bass’ marketing materials a consumer would naturally believe that the “13.68%” is a “real” meaning realizable net cash return on rollover assets. It’s not, of course. MasterDex 10 is arguably one of the least liquid indexed annuities ever marketed. Its focus is annuitization and Its surrender penalty is effectively perpetual. The annuity must be liquidated in systematic payments that begin not less than five years after contract inception and over a period lasting not less than 10 years. In other words, over a minimum of 15 years. Why? Think about the economics behind this annuity. It “pays” a 10% bonus to the consumer, a 9% commission to the writing agent and a 3% commission to the marketing company that wholesales the annuity. That’s a total of 22% paid out by an insurance company which invests the premiums it receives in bonds that pay about 6%, annually. The only way to make this work is to restrict liquidity to systematic payments with below-market internal interest assumptions over periods that last many years. It’s telling that MasterDex 10 is the most popular indexed annuity ever sold. The example of Mr. Bass’ YouTube video and report are vivid reminders that some contemporary annuity agents’ sales practices are a long way from meeting acceptable compliance standards. It’s hard to know where to begin in identifying all of the standards these marketing materials seem to violate: invalid and incomplete comparisons with investments; categorizing the annuity as an investment; inaccurate assertions as to the “investment” being “insured”; alleging comparison to CDs; comparing the annuity favorably to mutual funds, etc. Clearly there seem to be violations of “safe Harbor” ruling 151 and Rule 3(a) 8. On the other hand from Bass’ perspective there may be nothing at all misleading about the video and report. As an RIA he is his own compliance officer. Of course, RIAs are generally subject to audit including the content of their marketing programs. I do imagine, however, that Allianz Life might take issue with much that’s portrayed in these marketing materials. Perhaps an Allianz Life representative will choose to comment on this. What Would a Consumer Looking at Bass’ Materials Think? Allianz life has recently stated a strong commitment to upholding consumers’ interests. I believe this is a sincere effort. I also believe that Allianz Life had no prior knowledge of Bass’ strategies for marketing MasterDex 10. Rather, this incident is more likely a symptom of a free-wheeling annuity agent culture that sees producers engage in virtually whatever it takes to bring in their needed level of sales. I’ve written extensively on how this culture took root and also about the vicious cycle at work that sees more pressure put on agents with each negative article that lambastes annuities in the consumer press. Agents see no hope in a marketing strategy that publicly identifies them as individuals with an explicit agenda to sell annuities. That this pattern must be arrested is not in dispute. The only question is how. The benefits of annuities are too vital and too timely to not find a way. To address the root causes that lead annuity agents to engage in questionable sales practices I’ve spent a good part of the past five years leading Wealth2k’s development of compliant, next-generation communications networks, streaming educational video, advisor-branded micro sites and real-time monitoring capacity for compliance officers all designed to help annuity agents transition to a better/more compliant way of gaining new business. Agents cannot unilaterally implement such innovations, however. I believe these are inevitable capabilities that annuity providers must introduce if they stand a chance of saving the indexed annuity business in its present form. Sales practices like those used by Mr. Bass are a virtual invitation to the SEC to intervene in this messy situation. That would be tragic, in my judgment. Is it finally time for indexed annuity providers to take urgent action? EBRI’s Dallas L. Salisbury to be Featured in Leaders & Innovators Interview Series. An interview with Dallas Salisbury, President & CEO of the Employee Benefit Research Institute (EBRI) will be appearing soon as part of the Leaders & Innovators series. EBRI is an unbiased research organization whose stated mission is to contribute to, to encourage and to enhance the development of sound employee benefit programs and sound public policy through objective research and education. EBRI is one of the 25 most frequently quoted “think tanks” in the world. Salisbury joined EBRI as its founding in 1978. He is regularly featured at Congressional and Commission hearings, and in print and broadcast media around the world. Salisbury assists as a member of a number of commissions, study panels and editorial advisory boards. He is a Fellow of the National Academy of Human Resources and a member of the Board of the NAHR Foundation, the Fidelity Research Institute Pyramid Prize Advisory Board, the Commission on a High Performance Health System, the Board of the NASD Investor Education Foundation and the Board of Advisors to the Comptroller General of the United States, the NACUBO Human Resource Quarterly Advisory Panel, and on the GAO Advisory Group on Social Security and Retirement. He has served on the Secretary of Labor’s ERISA Advisory Council, the Presidential appointed PBGC Advisory Committee, the Board of Directors of the Society for Human Resources Management, the U.S. Advisory Panel on Medicare Education, and the Board of Directors of the National Academy of Social Insurance. Salisbury has been honored with the Award for Professional Excellence from the Society for Human Resource Management, the Plan Sponsor Lifetime Achievement Award and the Keystone Award of World at Work. Dallas was a delegate to the 1998, 2002 and 2006 National Summit’s on Retirement Savings, and the 2005 White House Conference on Aging. Salisbury has written, edited and lectured extensively on economic security topics, including 24 books and 129 book chapters and articles. 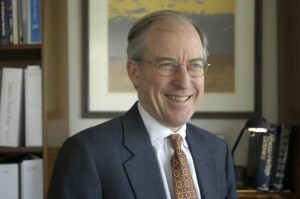 His most recent books are: “Retirement Security in the United States: Current Sources, Future Prospects, and Likely Outcomes of Current Trends”, “The Future of Retirement Income in America”, “The Future of Social Insurance: Incremental Action or Fundamental Reform?”, “IRA and 401(k) Investing” and “Managing Money in Retirement”. Prior to joining EBRI, he held full-time positions with the Washington State Legislature, the U.S. Department of Justice, the Employee Benefits Security Administration of the U.S. Department of Labor, (formerly known as the PWBA) and the Pension Benefit Guaranty Corporation (PBGC). He holds a B.A. degree in finance from the University of Washington and an M.A. in public administration from the Maxwell School at Syracuse University. Macchia – Just by way of background for my readers, would you be kind enough to talk about your position and title at Northwestern Mutual, and specifically, what your role there involves? Robinson – Sure. I am responsible for developing the strategic initiatives for what’s called our Investment Products and Services Division. My primary focus right now is developing our retirement planning philosophy and strategy. However, I also have responsibility for strategic initiatives that include our wealth management company, our broker/dealer, the development of our annuity products and our mutual fund products, specifically the integration of Frank Russell Mutual Funds into the Northwestern Mutual Financial Network. Macchia – Chuck, I know that you’ve been a very active road warrior, you’ve been a speaker at many industry conferences and among the things that you’ve talked about, and I’ve certainly heard your presentation at least a couple of times, is what I would categorize as a very innovative solution for long-term retirement security, albeit one with a different approach and focus than perhaps anything that we’ve seen anywhere else. I know you know what I’m talking about. I’d like to explore this in some depth because I thought that it was a rather fascinating solution when I first saw it. Cleary the creator of that solution, which I take to be yourself, has seen some insights that perhaps others are missing. I’d like you to take me through, if you would, what was going through your mind when you first thought of this solution. Robinson – It’s really interesting. This whole idea that you refer to, that we call the Lifestyle Income Approach (LIA) or a phased income approach, is something that I’ve been thinking about for a long time. I began working on pieces of it 25 years ago when I was helping non-profit employees plan for retirement. I have spent most of my career focused on retirement planning and retirement income development. For about 20 years I was with a company called VALIC (Variable Annuity Life Insurance Company) which used to be a subsidiary of American General and is now wholly owned by AIG. Their whole focus was on developing retirement programs primarily for public employees, school teachers, university employees, health care workers, state, county municipal government employees, and eventually they got into the 401K market. The real genesis of the LIA concept lies in a group of ideas that are neither unique nor revolutionary, nor were they invented by me. They are ideas that have been around for a long time. Some of the ideas that are key components of the lifestyle income approach are things like the old split annuity concept, which was a pretty common part of any retirement planners arsenal when I came into the business 25 years ago. I should point out that there was a time in my career when I actually worked as a retirement planning advisor. I started out as a financial planner in the field and spent a lot of time with people who were planning their retirement. There was no question in my mind that when I talked to retirees about their dreams, their hopes, and how they expected to live out their lives in retirement, they had a vision of how they would be living that was at odds with a lot of conventional thinking. The conventional thinking was that you started out with a set withdrawal amount roughly equal to 60%-80% of your pre-retirement income and you increased it by inflation every year for the rest of retirement. However, the more I talked with people, the better I understood that they did not intend to spend less in retirement than they spent when they were working. In fact, they were actually planning to spend as much or even more money in the early years of retirement than they did when they were working. In those early years, they perceived they would still be relatively healthy, vital and active and they intended to live out their dreams of travel, recreation and leisure while they were still young enough to enjoy them. Subsequently, McKinsey Consultants and others have conducted some fascinating research that has validated the tendency for affluent retirees to spend as much or more in retirement. McKinsey discovered that, on average, 40% of people spent as much in the first few years as when they were working. Among affluent retirees (those with more than $1 Million in investable assets), 60% spent as much money in the first few years of retirement as they spent when they were working. Those findings are certainly consistent with what I observed when I was in the field working face-to-face with both pre and post retirees. However, I’ll never forget one experience when I was talking with a client about this issue and I was sharing my perception that people don’t spend the same amount of money all the way through retirement. I think they spend more in the early years of retirement and it starts to decline as they get older. Sometime in their eighties it starts to decline pretty dramatically. Certainly by the time that somebody gets into their nineties or even one hundred they are just not as active and they are not as vital. My client suddenly looked at me and he said, “You’re describing my mother.” I said, “Well, tell me about mom.” He said, “My father was an executive for a small company that was bought out by a Fortune 100 hundred firm. Mom was left in pretty good shape. She inherited about $5 million in company stock and it is now worth about $15 million.” He said, “She’s eighty-six years old.” And I said, “Well tell me about how mom lives.” He said, “Well, three things are really important to mom. Number one is menthol Kool cigarettes (hard to believe that she lived to be eighty-six). Number two is the rock candy that she used to eat when she was a little girl. Number three is Vernor’s ginger ale.” I looked at him, I smiled and I said, “Well, tell me how much of those mom can eat or smoke in a year. He kind of laughed and I said, “Obviously what I’m asking you is, how much money do you think your mom is spending?” He said, “Well, she’s no longer living in the big house. She moved to a small condominium. She doesn’t travel the way she used to. I’d be really surprised if mom is spending more than $50,000 per year.” Now this is somebody who, when her husband was alive and they were young and they were healthy, was probably spending several hundred thousand per year. The more I thought about that I really began to look around at people that I knew – relatives, neighbors, people who lived in my community – and when I speak to advisors I frequently ask them, “I want you to think of someone that you know, or knew, who was more than ninety-five years old. I want you to get a picture of that person in your mind. Tell me about the kind of lifestyle they live.” And obviously at ninety-five the issue isn’t “Am I going to travel around the world?” The issue is “Can I keep my driver’s license to be able to travel around the corner to go to the local grocery store.” Almost without exception, the level of income expenditure for consumable income needs beyond the age of 95 is significantly reduced, other than potential health care. Health care is always a major wild card and should be addressed separately with a different set of metrics and assumptions regarding inflation, costs and investment solutions. There’s no question that running out of money is one of the worst things that can happen to retirees. However, for many retirees, the next worst thing to running out of money in retirement is discovering that they cheated themselves out of opportunities to enjoy their retirement by spending too little money when they were young, healthy and active. It became clear to me as I talked with people and sat down to plan with them that you had a lot of elderly people who had skimped and saved and had done without during their working years and in the early years of their retirement, only to discover in their late eighties or nineties that they have all this money left over. Some of that was a factor that we were going through the great markets of the 1980s. You had people like this woman, whose original $5 million had now grown to $15 million. The sad thing was, at 90 or 95 there was almost no marginal utility to that additional money. What difference did it make whether her income was $50,000 or $500,000? She couldn’t enjoy the additional income and she couldn’t use it. On the other hand there is a tremendous marginal utility to every dollar that can be used on the front end of retirement. Although most retirees really want and can use more money on the front end, they are absolutely frightened to death to spend money on the front end of retirement because, “We’ve got to save for a rainy day.” There may be a time when we require hospitalization, long term care and/or home health care. Of course, this is precisely why I advocate addressing these issues first; then, dealing with the issue of generating consumable retirement income. The next part of the LIA concept was trying to figure out the role of annutities. Most 65 year olds are reluctant to trade access to their assets for a slightly higher income payout. As a result, most immediate lifetime annuities are not purchased until 10 years after retirement when retirees begin to realize they may not have saved enough to cover the increasing costs of retirement. Considering all of these factors, the thought occurred to me that perhaps it made more sense to delay the annuitization decision until Age 85 when the mortality premium was so high, and was so large, that you literally could generate twice as much income as the traditional method for the same amount of assets; or, you could generate the same income for half the assets. At Age 85, the consumer has an enormous incentive to trade liquidity for a significantly higher income and by Age 85 most retirees will have a much better idea of whether they will need a larger income. Of course, half of them will be deceased and will never have to deal with the issue. Deferring to 85 also gives the retiree liquidity and access to assets from 65-85 and aligns with the advisor’s interest in continuing to receive an asset based fee. Combining this concept of delaying the annuitization decision with an understanding of the phased nature of how people spend money in retirement and a desire to create a program that advisors would embrace really got me thinking about how you put all of these ideas together. And then the next piece of the LIA concept was stimulated by an article Bill Bengen published in the Journal of Financial Planning in 1994. I think that everybody who works in the retirement income space owes an enormous debt of gratitude to Bill Bengen. His research caused all of us, for the first time, to think more realistically about the magnitude of a safe and sustainable withdrawal percentage. Almost all retirement planning approaches today are based on his conclusion that 4% is the Rule of Thumb for an initial withdrawal amount. However, his real impact on my thinking was to make it crystal clear, for the first time, that the real threat was a potential down draft in equity markets during the first ten years of retirement, even the first 4 or 5 years. In short, the major focus of retirement planning was on “Worst Case Scenarios” and how to insulate retirees from the shock of another period like 1965-l975 or another Great Depression. The more I started thinking about all of this it struck me that there were three major objectives: number one is the goal to create multiple levels of phased retirement income spending that gradually decrease instead of increase; number two is to insulate investments in the first ten years of retirement from market declines; and, number three, is that all retirement planning is focused on worst case scenarios, yet worst case scenarios only take place about 15% of the time. It was at that point that I started to put together this concept that you use potential annuitization at age 85 as a hedge or an option like a put, as a way to allow yourself to recover from bad markets in the first ten years of retirement. I believed advisors would buy into this since the odds were pretty low they would ever have to commit “annuicide”, as Garth Bernard calls it. The reason the odds are so low is that half of those who started at 65 will be deceased by 85 and there is only a 15% chance the survivors will have lived through a Worst-Case Economic Scenario. As a result, the odds are only about 7.5% a retiree will ever have to consider annuitization. Moreover, half of those who survive to 85 are likely to be so ill that it wouldn’t make any sense to annuitize so that the odds are potentially 3-4% a retiree will ever actually have to annuitize. Yet, 100% of retirees can benefit from planning to use annuitization as a hedge since they will be able to draw out, on average, twice as much money at the beginning of retirement as the conventional method. In order to verify these concepts, I started to play around with all of those things and I started to run some historical scenarios so I could look at what would happen if you implemented these ideas. Then, the next piece of it that fell in place for me was a better understanding of the dynamics of longevity for a retired couple, as opposed to a single individual. One day when I was working with one of our actuaries on life expectancy projections, we started talking about this issue of who’s going to live beyond age 95? Of course everybody has seen the statistic that says if you take all of the couples age 65, the odds are pretty high that one of them will live beyond the age of 95. In fact, for the whole population, about 25% of couples will have one member who lives to Age 95. If you take the healthy part of the population, it goes as high as 50%. However, as we talked it struck me that it might be more interesting to look at the opposite side of that number. The question I wanted the actuary to answer was: If I take all of the couples starting at age 65 how many of them still have both people alive at 95? The actuary came back and said that it was a very small number; it’s less than 3/10ths of 1%. I asked how many at 85? He said that it was only 18%. I said that’s a huge, huge insight. We know with a fair degree of certainty that beyond 95 we’re only planning for one person. In fact, in the majority of cases beyond 85 we’re only planning for one person. Even if I bought into the concept that you’re going to spend the same amount of money every year throughout your entire retirement, I know with a fair amount of certainty that beyond 95 you’re only going to be spending 75% of what you used to spend even if you’re spending at the same level, you’re traveling as much, you’re playing golf, you belong to the country club, and all of those things. The more I thought about that, intuitively, it just didn’t make sense to me. Health care expenses are projected to increase 7 – 10% and inflation, historically, has increased at only about 3%. Consequently, you’ve got a huge mismatch between a revenue stream rising at a 3% CAGR to meet a liability stream growing at 7-10% CAGR. How can we be sure that the extra money that you’re not spending on consumption is enough to pay for health care premiums and health care costs? It was about that time that I ran across an article sharing the research being done by the Employee Benefit Research Institute (EBRI) under the direction of Dallas Salisbury, CEO, and Paul Fronstin, who is their Health Care Expert. I’ve known Dallas most of my career and he and Paul were kind enough to sit down with me to talk about this health care issue. I thought these guys were just right on about calculating what it might be and about how it would look. Using their research, It didn’t take long to create a spreadsheet and a set of reasonable assumptions to demonstrate that, in fact, the conventional method is unlikely to generate in Worst-Case Scenarios enough to pay for healthcare expenses, even if we assume consumption declines by 50% beyond 85 and 60% beyond 95. It was at that point that it suddenly began to strike me that when you do retirement planning you’ve got to break this apart. You can’t plan for both consumption and health care using the same set of metrics, the same investments, and the same strategy. They are so different, the inflation rates are so different, the potential costs are so different, that you’ve got to set up a different method or process for planning for health care. It was at that point that we started working on just exactly how much money will you need for health insurance premiums and out of pocket costs and long term care? How would you fund that? How much would you set aside? EBRI doesn’t really address LTC and uses an accurate, but conventional method of calculating funding that’s not designed to meet Worst-Case Scenarios. We elected to rely upon EBRI’s estimate of health care costs, but to develop our own funding approach that would incorporate Worst-Case Scenarios and would utilize both the leverage in the mortality premium of a lifetime annuity and the risk sharing features of LTC policies. We did this because the estimated costs were potentially so high and so unpredictable. EBRI estimates that a couple at Age 65 who expect to live to 100 may need almost $800,000 just to cover health care costs. Once you add in the cost of LTC, vision, dental and hearing, the worst-case estimate can exceed $1 Million. Admittedly, it is not very likely both members of a couple will live to 100 and it is unlikely they will incur the max Out Of Pocket expenses each year. On the other hand, we have found that our affluent policyowners tend to be healthier than the general population and they like the concept of trying to protect themselves against worst case risks by covering all the bases. Obviously, these estimates need to be customized for each client. We began doing a lot of work evaluating a wide range of assumptions and have concluded there is no simple, absolute or single correct answer. Depending on a retiree’s assumptions, wealth and tolerance for risk, the number that needs to be set aside to fund healthcare and LTC could potentially fall anywhere between $1 million to as low as $160,000, per couple. Given the wide disparity in estimates, It became clear to us that the calculation has to take place apart from and before you deal with retirement income spending. As that fell into place, it became very clear to us that there was a hierarchy or priority in terms of how you solve these problems. It was then that I hit on this concept that the real things that ruin your retirement happen at the end of retirement not at the beginning. You really need to start at the end, you need to say, “How do I address long term care? How do I address heath care? How do I address out of pocket expenses? How do I address longevity?” We do those first and we then work backwards. The minute we started doing that, we started running examples and 95 seemed like the logical place to begin because there is a fair amount of certainty that we are probably planning for only one survivor beyond that point. We began working backwards in 10 year increments on how much money you would need from 95 to 105 and beyond that. How much do you need from 85 to 95? And of course what we discovered was that it was possible to save a lot of the money that the conventional method set aside for those periods and move it to the front end of retirement, especially in our network where we’re dealing with many affluent clients who by and large are pretty heavily insured. And we sat down and asked the question, “What if we have somebody who is very affluent and is very heavily insured?” We looked at an example of somebody with $6 million that they could turn into retirement income and $3 million of permanent cash value life insurance. You then ask the question, “How much money does that couple have to set aside beyond age 95?” The current odds are that 99 and 7/10ths percent of the time there will be only one person left, which means that the person who survives will have received either a $3 million payout from their insurance policy or they will have $3 million in cash value. It’s pretty clear that the heavily insured individual needs to set aside less money to fund the period beyond age 95. All of a sudden, all of the money set aside by conventional retirement planning methods to generate income beyond Age 95 can now be pushed forward to use earlier in retirement or can be set aside as a reserve. Of course, we also discovered we can fund the same amount of money at Age 85, in a worst scenario, using a lifetime annuity income with half the assets, which means the other half can be pushed forward to the front end of retirement. Macchia – Chuck, where do I begin? Let me ask you a couple of questions. The strategy that you outline with great articulation and detail clearly would run counter to strategies that are developed more in harmony with the conventional wisdom that plans for income that gradually accelerates, ideally according to an inflation assumption over a long period of time. Why do you feel that more people- including many smart people, have not looked at this issue in the same manner that you have? Robinson – I think you’ve hit on the key factor, which is intuitively people would look at that concept and say you’ve got it all backwards. We have been taught, we have been coached, that you save for that rainy day. I think the second reason that more people have not focused on this concept is that most retirement planning has been done by people with a background in investments. If you read most of the articles and most of the research, these are folks who spent their careers as investment advisors or spent it in the investment advisory sector of the financial services industry. There are far fewer people who come from the life insurance or risk based side of the business. Most advisors don’t even think about lifetime annuitization or lifetime annuities or LTC Insurance as being arrows in their quiver, or tools they would use to solve for retirement. Most investment advisors would readily admit they are unprepared to advise their clients regarding Medicare/Medicaid or projected retiree health care costs. Moreover, most do not handle LTC insurance. They may outsource it to a strategic partner, but they don’t have that expertise or background. In general, investment advisors have been comfortable relying on the widely accepted (but misguided) conventional wisdom that the affluent (more than $1 Million in investable assets) don’t need LTC insurance and are generally wealthy enough to self-insure for both healthcare and LTC. Macchia – Do you think there’s a chance that a strategy like yours is given less attention than it deserves because it’s coming from a life insurance company? Macchia – Perhaps because it reflects my own experience and background having entered through the life insurance door, I’ve always felt that people who begin their careers with some years of experience working with retail clients carry through their careers a lifelong advantage in having a sensitivity and a perception of how products and strategies pertain more in the practical, real world sense, as opposed to a more sterile, academic view. Do you put any credence into that? Robinson – It’s an interesting observation on your part and certainly in my career it’s been a huge advantage that I’ve had that field experience, and I had it with a company that was in the insurance space because there is no question that I never could have developed this strategy without having had that background. Number one, I had the experience of sitting across the table, face to face with literally hundreds of people planning for retirement, so I had done a fair amount of consumer research sampling, admittedly unscientific and not very statistically accurate. However, I had a pretty good idea of what people wanted and what was important to them in retirement. And secondly, I don’t know if it’s because I worked for a company in the insurance business, because I was always in the investment division of the company, I was not someone who was a big life insurance producer. However, I didn’t automatically reject the idea of life insurance and annuities. I was exposed to a lot of background, education, and understanding of the importance of insurance products. I never bought into the concept that was so widespread back in the early eighties that you buy term and invest the difference. I just never believed affluent people would not need permanent life insurance protection beyond age 65, based on my understanding of what their needs would be as they got older. Macchia – Perhaps the main reason that today I’m so passionately focused on improving communications, and improving the ability of organizations to explain their value to consumers in language that they can understand, comes out of years of frustration; frustration in seeing some of the truly unique and valuable products that insurance companies offer, and understanding their inherent value, and seeing them poorly appraised and misconstrued so often to the detriment of consumers and advisors, and the insurance companies themselves. I think the responsibility for this state of affairs rests primarily with the insurance companies who 25 or 30 years ago, and this is not true for all companies, but for most companies, reverted to the stance that, We’re going to manufacture products and not worry about anything else.” The development of sales people, the development of good, concept-grounded educational tools, the development of good communication strategies, was largely sacrificed n favor of a focus of just manufacturing product after product after product. Thus, a vicious cycle was ignited that culminates in the commoditized world that we have today, where insurance products fight an uphill battle to gain recognition and acceptance. Insurers actually attempt to combat this syndrome through self-destructive, retrograde product development; certain products types become progressively less consumer oriented over time as insurers have only newer product with higher compensation with which to compete for distribution. Do you feel that this is an apt description? Robinson – David, I think that is an incredibly insightful, if not brilliant, analysis of why insurance products have not been more widely accepted. It mirrors my 25 years of experience in the business, spot on. Insurance companies’ home offices are filled with incredibly bright actuaries, attorneys, and product development specialists, but by and large, with a few exceptions, there are very few people who really understand how to market, communicate and explain these products in a way that not only meets the needs of the consumer, but that resonates with them so that they are motivated to enjoy the benefits of the product. Most companies focus on features instead of benefits. The most successful insurance companies have been those that recruited, retained, developed and valued executives with the background and/ or insight to develop consumer friendly marketing programs that focus on providing solutions to consumer needs. Robinson – That’s right. Even when they are selling to their intermediaries, they don’t know how to explain it to the intermediary. Macchia – Let me push this analysis a bit further then, because the result of this concentration on manufacturing has created another vicious cycle that I see. You can see this reflected in certain product lines, like say, indexed annuities where over the past ten years what was a very pristine idea and relatively consumer oriented in design became progressively more opaque, more complex, more cost latent and more anti-consumer. I lay the blame of this syndrome again at this same division 25 years ago to abandon everything but manufacturing, because what happened is, the advisors and agents of the world were not given the tools they needed to properly explain products. They were able to engage fewer and fewer customers and they had to resort to tactics that sort of camouflaged their true agenda. Because they were engaging fewer customers, it became more important to maximize the compensation on each of their declining number of sales on an annual basis. Hence the attraction to higher and higher commission products, with the carriers feeding into that by meeting a perceived need of the advisors by manufacturing even higher commission products, resulting in the cycle of regulatory problems that we have today. If you agree with this, how does this phenomenon potentially impact retirement and a life insurance company’s role going forward? Robinson – It’s a great question, David, and I think you raise a really huge issue about how the insurance industry is going to respond to the retirement opportunity and the retirement challenge. I go to a lot of conferences around the country every year and I hear people speak like Chip Roame at Tiburon, the folks at McKinsey, and people like Moshe Milevsky. These are really bright people talking about the retirement challenge. Most of these independent experts have made the observation that most of the major issues in retirement are really in the risk based insurance area. Several have suggested that this is the insurance companies’ game to win or lose, and yet, I hear a lot of people talking about the investment portion of the industry as the leader in stepping up to the challenge. In my opinion, there are some visionary and perceptive executives on the investment side of the business who may take this away from the insurance industry in much the same way they took 401Ks and defined contribution plans away from them. It’s just fascinating that some of the investment companies have moved so rapidly to integrate annuity products, for example, and in some cases even life insurance. I look at some of these companies and can’t help but be impressed. I look at someone like Fidelity who is one of the top sellers of lifetime annuities and was one of the first companies to address the issue of funding retiree healthcare expenses. I look at somebody like Merrill who is putting together some tremendous programs that integrate annuities, insurance and investments. And, it’s also true of some of the banks. I look at a bank like Wachovia who I think has made tremendous strides in integrating all of those. Admittedly, there are also some insurance companies such as Genworth, Hartford and AIG that have done a wonderful job of manufacturing products that resonate with intermediaries and consumers. In many cases, however, the investment companies and banks have stepped forward to take insurance products and use them more effectively than many of the companies in the insurance industry. I think it goes directly to your point and your issue of product manufacturers that don’t fully understand how to market, how to position this with the consumer and how to do it in a way that creates benefits for the consumer, the intermediary and the insurance company. Macchia – I wish that I could put all of the insurance company presidents in a box and shake it in order to get their attention on this. Let me get back to the phased income approach. Tell me about your experience at Northwestern. When was the program introduced? How has it been received? And what are the results that you are finding? Robinson – We started to introduce the phased approach back in 2004, so we’ve now had about 3 years where we’ve been talking about this concept at a very high level with advisors and the response has been overwhelming. The field intuitively grasped the importance, the advantage and the usefulness of this particular concept. However, the task of building out all of the supervision, compliance infrastructure, the technology platform, the training, the products, the services to be able to deliver it completely, is a pretty big issue for us. We anticipate that it will take several years to develop a robust capability to fully deliver our comprehensive vision of retirement planning. I don’t think that reflects the fact that the company doesn’t think highly of the concept or the opportunity. Obviously they’ve spent a fair amount of money applying for patents on the process, but I think it reflects that a project this big simply takes time. Macchia – You say that the company has spent a lot of money applying for patents. Robinson – They’ve spent a lot of money and a lot of support has been allocated. We have a high level, cross functional team that is working on this, but you’ve also got to remember that for the last two years we have had a major focus on transitioning financial representatives from being registered representatives to being investment advisors. These regulatory changes had an exclamation point put on them as a result of the court ruling that vacated the Merrill-Lynch exemption and Rule 202. Thank goodness we’ve spent a huge amount of resources and time to prepare for that. We’re in a pretty good place to respond to it. Macchia – Are most of your reps now functioning as IARs? Robinson – We have about 1300 who are advisors. 300 of them are Wealth Management Advisors who can charge a fee to do investment advisory or financial planning work. We have approximately another 1000 who are investment advisors who can use software that provides a comprehensive financial plan, but they don’t charge for the plan. That’s out of a total field force of a little over 7000. You might see a little more migration somewhere in that balance as time goes on. However, we think that ratio is about right. We’re huge believers in a network of specialists and we’re not sure that all of our reps need to become, or should become, an investment advisor, but they should have access to investment advisors for joint work in order to meet both the risk based needs and the investment advisory and financial planning needs of their clients. Macchia – Is there any concern that some of the life insurance planning that the typical representative is doing can be deemed across the line into planning? n the case of older, extremely successful life insurance representatives, they frequently prefer referring investment advisory work to one of our specialists in order to avoid the distraction, time and money required to build out their own investment advisory practice. In the case of younger representatives, with less than five years of experience, they are generally focused on building an insurance practice with younger policyowners who haven’t yet reached a point in their careers where their assets match the profile for investment advisory services. When they do run across someone who meets the profile, they can also do joint work with one of our investment specialists. At the risk of oversimplifying the issues, I think the essence of the FPA lawsuit against the regulators is that we have way too many people holding themselves out as advisors when in fact they are sales people. I think that is the crucial point that the FPA has tried to make, and legitimately tried to make; that when I’m a consumer and I engage a financial professional, it should be clear to me whether they are acting as a salesperson or serving as an advisor with a fiduciary responsibility. I think the dispute over the last couple of years between the FPA and the SEC has helped to clarify that distinction. It has meant a huge amount of change and it has not been easy or inexpensive to turn around a ship as big as Northwestern Mutual or any of the other distribution systems, but I am guardedly hopeful that it will end up being a good thing for consumers and for the industry. However, the risk and cost of delivering a fiduciary standard of care is significantly greater and, as a result, there is no question that many consumers will end up paying more for advice and/or some segments of the consumer market may be underserved. In the long run, I would not be surprised to see industry and consumer groups seek legislative relief. Macchia – Let me ask you about something we talked about a moment ago. You mentioned the loss of the 401K business. I remember 30 years ago, when I came into the business in 1977, and the insurers owned the pension business. Then they progressively lost it to the mutual fund complexes. Now we’re staring at this great opportunity of Boomer retirement security. If you were to give it odds on the basis of 10% to 100% that the insurers will get it together and seize the day, and take back the prominent role, how would you evaluate the odds? My response was that everybody is going to win. This is so big. The assets are so large that each of those various distribution networks are going to get a very large piece of it. However, I think what you’re really asking me is a slightly different question which is, “Will the insurance companies increase their market share or stay the same or will it decrease?” Everybody’s opinion is probably valid here and I have no particular crystal ball, but if I had to guess, my guess is that the insurance industry, as a whole, will not increase its share of Baby Boomer retirement assets. Of course, there will be a number of insurance companies that will hold onto their share, maybe individually they will even increase it a little bit, but I don’t see across the board the insurance industry making the same kind of organizational, marketing, communication and platform changes that I see at companies like Fidelity, Merrill, Wachovia and others, especially the Independent RIAs. Every marketing survey I’ve seen indicates the consumer views the RIA channel as the one that is best positioned to address their retirement needs. Over the last ten years, the number of RIAs and their market share has steadily increased. Some financial services companies have moved quickly to organize themselves to meet this challenge and to position themselves to capture Baby Boomer assets. In my opinion, the insurance industry, with a few notable exceptions, has tended to lag behind the other distribution channels. Macchia – I have said many times publicly, and continue to believe, and I’ve been called a romantic for believing it, that those organizations which will succeed in Boomer retirement will not be those with the “best” products, but rather will be those that are the best communicators, those able to compliantly communicate their value to a large and fluid pool of customers. I’m curious to know if you agree with my belief? Robinson – I buy into it completely. I think that you are absolutely right, I think that you have loads of examples of that, and I also believe that this is one of those cases where retirement planning is so complex that it is difficult to comprehend. The consumers are so puzzled and confused that they are going to gravitate to those distribution networks that have a clean, clear message and that simplify these issues for them and explain the challenges and how to solve them in very simple, direct language that consumers will understand. I think there are still large numbers of companies whose approach to the market is so complex, whose products are so complex, that not only do the consumers not understand them, but the intermediaries representing them don’t fully understand them. Macchia – I so much agree with that. I try to get people to understand that effective communications equals clarity in the consumer’s mind, equals confidence, equals conversion. It’s too bad that you and I weren’t 20 years younger. Robinson – I say that all the time, David, and I say it when I’m speaking with audiences of younger people entering the financial services industry and certainly younger groups of representatives at Northwestern Mutual. For 25 years this has been one of the greatest runs that I can imagine. However, I wake up every day and think that the prior 25 years pales in comparison to the career opportunities to capture assets that young people have today. I’m like you. I wish I was 20 years younger. Macchia – Thank you for your time and insights. I really enjoyed it. Robinson- I did too, David. Northwestern Mutual Financial Network is the marketing name for the sales and distribution arm of The Northwestern Mutual Life Insurance Company, Milwaukee, WI (Northwestern Mutual) (life and disability income insurance, annuities) and its subsidiaries and affiliates. Northwestern Mutual is not a broker-dealer, registered investment adviser or federal savings bank. Securities are offered through Northwestern Mutual Investment Services, LLC (NMIS), 1-866-664-7737, a wholly-owned company of Northwestern Mutual, broker-dealer, registered investment adviser and member of the NASD (www.nasd.com) and SIPC. Russell Investment Group is a Washington, USA corporation, which operates through subsidiaries worldwide and is a subsidiary of Northwestern Mutual. Northwestern Mutual Wealth Management Company, Milwaukee, WI, a wholly-owned company of Northwetern Mutual, is a limited purpose federal savings bank. Each network representative represents one or more, but not necessarily all of these entities. Products and services are offered and sold only by appropriately licensed entities and representatives of such entities. Two of the nation’s leading experts on retirement income distribution planning, Philip G. Lubinski, CFP® and Briggs A. Matsko, CFP®, will be featured in my new interview series called “America’s Elite Financial Advisors.” Both Lubinski and Matsko have spent years developing and implementing income-generation strategies for their respective retail clients. Their success in income planning has not only catapulted them to elite status in terms of production, it has also positioned them as thought leaders and retirement income gurus to other advisors eager to master the strategically important specialty of income distribution planning. Matsko is Executive Vice President of California Fringe Benefit, a subsidiary of Lincoln Financial Advisors based in Sacramento, California. 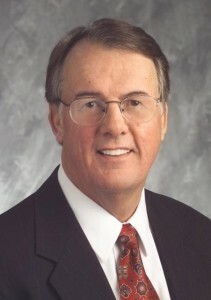 Lubinski is President of First Financial Strategies, LLC, headquartered in Denver, Colorado. Matsko is the developer of the Matsko Method™, a process-oriented approach to expense management and retirement income generation. Along with Wealth2k, Lubinski is co-developer of The Income for Life Model®, a strategy for generating lifetime, inflation-adjusted retirement income. Lubinski and Matsko enjoy national reputations as true experts in retirement income planning. I’m sure that their insights will be invaluable to any reader interested in tools and techniques around the practical implementation of retirement income generation strategies. Both Lubinski and Matsko will be sharing their extraordinary expertise from the podium at the Retirement Income Industry Association’s Annual Meeting to be held in Boston on September 17. If you want to understand retirement income from the perspective of successful implementation at the retail level you should not pass-up this opportunity to hear from these gentlemen in person. Whose Side Am I On? I’m On the Side of a Successful Annuity Industry. And I Can Prove It! Following my essay on the July 8th article that appeared on the front page of the New York Times, I heard through a friend that a life insurance executive employed by one of the companies mentioned in the Times article read my piece and then called my friend to ask, “Whose side is Macchia on?” It’s a fair question that deserves a straight answer. The answer is that I’m on the side of a vital and healthy annuity industry. Please read on and I’ll prove it to you. Clearly, some of what I’ve written about the annuity industry is critical of certain sales practices and products that I view as ultimately detrimental to the health of the entire annuity industry. I’ve also criticized in a general sense the top management of some companies for countenancing these practices. By doing this I’ve served as a lighting rod for some who reflexively seek to defend the status quo even though that defense is damaging to the long-term interests of the industry. As someone who truly loves the insurance business and has benefited so much from my involvement in it, my criticism has always been intended as constructive. Of course, it may not appear that way to some. Sometimes good and decent people ignite bad business practices. In one of the installments of the blog series I called “The Preventable Demise of the Fixed Annuity Industry” I talked about the fact that the people in management positions in life insurance companies are almost universally good and decent individuals. I’ve met hundreds of insurance company executives and I’d be hard pressed to remember more than a couple I didn’t like. The business is staffed by legions of quality people. I’ve had the greatest association with executives responsible for sales, marketing and product distribution. Virtually all of these people live under high pressure to deliver sales on a quarter-by-quarter basis. Because this pressure comes from top management, it’s almost impossible for these individuals to take a long-term view. At the CEO or Presidential levels there is also often times severe pressure to achieve sales targets. This gets transmitted to the distribution executives, regional managers, sales desk and individual wholesalers who are charged with forging the relationships with distributors that result in new sales. The distributors present a constant challenge to insurance company distribution executives who are many times played-off against each other by the distributors. The big marketing companies ask, “Company A did ‘this’ for me so why don’t you match it?” There’s intense pressure on company “B” to match company”A”. The “this” that’s being asked for has often been products that pay higher compensation or have “special” features that appeal to marketing companies and down line agents. This process repeats itself in a serial fashion and the result over a number of years is that products that start out with excellent consumer value can devolve to versions that are far worse. To effectively disguise the loss of consumer value gimmicky features emerge that mask the higher costs structures needed to generate higher levels of commissions. This is the history of the indexed annuity business. As this process unfolds the annuity providers find themselves between a rock and a hard place. They are under pressure to generate new sales and they are forced to make compromises within limits to get those sales. The intensity of competition among carriers for relationships with distributors is extreme. The natural tendency is to cave in (again, within limits) and give the distributors what they are asking for. All product manufacturers need distribution to be successful. So what’s described above shows how good and decent people perform in a high-pressure game to deliver annuity sales. No one involved intended to damage anyone, least of all consumers. It’s a big, complex and aggressive process that yields the negative results we have today. None of this, however, changes the fact that in order for the annuity industry to reach its potential it must confront the negative results the process delivers. As years pass and the negative results expand exponentially culminating in Sunday’s New York Time article, you reach a point where the business is so threatened at its most fundamental level that drastic action is called for. We’re at that point, in my judgment. We’re all blessed with skills that are as diverse as we are. Take me golfing and you’ll be in for a good laugh, I have to tee-off with an 8-iron because it’s the only club I can use to hit the ball straight. On the positive side I was blessed with a special vision for this industry and I could see years ago what the industry is confronted with now. Two years ago I saw the future of the equity-indexed annuity business. I saw that it was on a dangerous course in terms of its most popular products offering the lowest levels of value to the consumer. I saw the unpleasant inevitable result of combining gimmicky products with poor sales practices. I literally had the vision of the New York Times article of last Sunday. Driven both by my sincere desire to set the indexed annuity business on a course for quality growth (and make some money), in November of 2005 I conceived and set about to build a web-based application designed to separate the quality providers of equity-indexed annuities from the “bad guys.” Even then I recognized the urgency to create an un-level playing field in favor of the good companies at the expense of the other companies. The solution to accomplish this was a one-of-a-kind web-based application called EIAToday™. We went to work on the application development in December of 2005 and finished it by late February of 2006. The idea behind EIAToday was to use compliant, web-based technology, video sales presentations and web-based marketing to dramatically improve the manner in which agents could explain the benefits of indexed annuities. It was intended to help expand the “pie” and increase the total volume of annuity business agents produce (I remain convinced that only by helping agents grow their sales volumes will they be able to afford the transition to superior products). The technology platform underneath EIAToday was unprecedented in its capabilities and would have allowed quality insurance carriers to distribute indexed annuity products across multiple distribution channels in a consistent and compliant fashion. The companies would have been able to monitor their agents and insure that all required broker-dealer disclosure on an agent-by-agent basis was being presented to the public. The technology would have allowed the carriers to meet any distributor-specific requirements in terms of customized marketing materials and disclosures. Every agent would have been provided a personally-branded micro site capable of streaming a compelling (and compliant) video educational presentation for consumers on indexed annuities. This would have enabled more consumers to learn about indexed annuities in a way that maximizes convenience and compliance. Remarkably, the video presentation even received successful review by the NASD. Actually, the reaction among the life insurance executives to the NASD-reviewed presentation was quite interesting. Some reacted extremely negatively feeling that I had essentially betrayed the industry by asking the NASD (through a B-D customer) to review a presentation on what is not a security. Others thought it was very effective. In fact, as an educational presentation it achieves what I like Wealth2k to achieve: it explains a complex product in a fair and balanced manner without sacrificing sales appeal. Had it gone into wide circulation it would have been a key enabler in helping insurance companies foster quality relationships with broker-dealers. It’s just what the broker-dealers needed… and still need to better educate their registered reps. It was a time-consuming and expensive effort to build the EIAToday application and I honestly felt that I had conceived a better future for the indexed annuity industry. I invited eight quality companies to the Ritz Carlton hotel in Boston to come together and redefine the future of the indexed business. What an ambition! They did come. Some sent more than one person. What resulted from the day long meeting? Nothing much. Actually one company did signal interest but that company hadn’t yet come to market with its indexed annuity and ultimately never did. These quality companies passed on what was a remarkable opportunity to distance themselves from those companies that have spoiled things for all annuity companies. They could have benefited themselves and consumers greatly had they been able to pull the trigger. I have no regrets at all over the EIAToday effort in spite of the substantial financial and emotional investment made. I still like and respect all of the people who attended that opportunity meeting. I understand that when things are going pretty well it’s difficult for insurers to come to a decision to change what they are doing. But now I believe that companies no longer have the luxury of suspending disbelief. Sales are declining, the public image of annuities has plummeted, regulators are advising seniors to stay away and the future is uncertain. Perhaps I should pull EIAToday out of the closet? Make it exclusive to one company? The next few months will prove to be a very interesting time for the entire annuity industry. How it chooses to respond to today’s vexing problems will likely define its future for the next decade. It will also largely determine its success in attracting Boomers’ retirement assets. I think my tangible investment in developing the EIAToday application proves how determined I was then and am today to help make a more healthy and successful annuity industry. It also proves that my vision is quite real. When challenges present themselves one can hunker down and defend even the worst aspects of the status quo, or, see that a new and promising door has been opened.